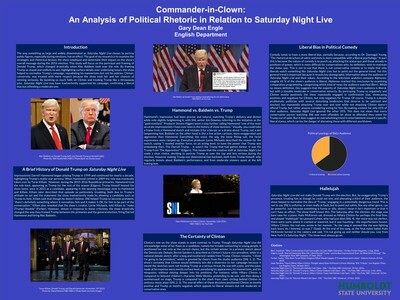 The goal of my research is to examine the strategies and rhetorical devices Saturday Night Live show employed and determine their impact on the show’s overall message during the 2016 election. This study will focus on the portrayal and framing of Donald Trump, which changed drastically when Alec Baldwin took over the role. By framing Trump as stupid and unlikely to win, highlighting surface details over underlying issues, the show helped to normalize Trump’s campaign, repudiating his mannerisms but not his policies. Clinton, conversely, was treated with more respect because the show took her and her chances of winning seriously. By lavishing so much faith on Clinton and treating Trump like a throwaway joke, Saturday Night Live may have inadvertently supported his campaign, confirming a liberal bias but offending a moderate one.